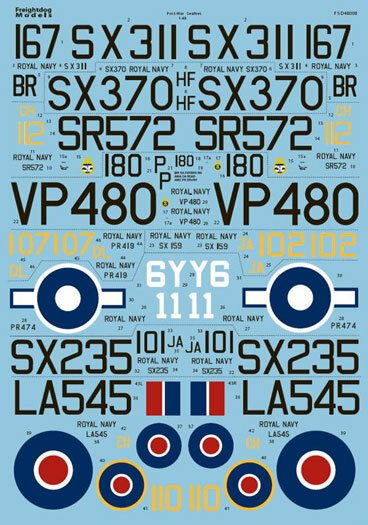 Just a quick heads up that our latest decal sheet has arrived and is available to order. This sheet includes options for nine different Post-War Fleet Air Arm Seafires in 1/48th scale, including marks XV, XVII, FR.46 and 47. They are designed for the new Airfix Mk.XVII and re-issued Mk.46/47 kits. Note a Mk.XV can also be made by cross kitting the Airfix Spitfire Mk.XII and Seafire XVII, although some scratch building will be required. and lastly FR.46 LA545/110 of 1833 RNVR 1948 (Temperate scheme). Please note in order to get so many options on the A5 sheet, no 'D' type roundels are included. These can be sourced from the Airfix kits (which will have Cartograf printed decals included) , but for one of the Mk.XV and three of the Mk.XVII options you still require two 36 inch roundels for the underside (as Airfix have chosen an option that has smaller roundels under the wings). No stenciling is included however both Airfix kits due out soon include comprehensive stencils. This is a limited edition with initial print run of only 200 sheets, a re-run is not likely unless there is significant demand. Price of the sheet is £9.00 plus £2.00 postage worldwide direct from our website, and also available from Hannants very soon.